United States President Barack Obama arrived back in the U.S. late Saturday just a few hours after having a face to face historic meeting with Raul Castro the President of Cuba and a first meeting ever with Nicolas Maduro the President of Venezuela. The historic meetings took place in Panama during the Summit of the Americas and came after Castro and Obama had announced in December that they were moving toward the normalizing of ties between the two countries, following a 50-year animosity. Obama characterized the meeting with Castro as fruitful and candid, while his administration said that Obama voiced his support for a peaceful dialogue with the government of Venezuela and its opposition during his brief talk with President Maduro. The U.S. president said he would review the recommendations to take Cuba off the list of state sponsor of terrorism, which is another step needed before embassies are able to reopen in Havana and Washington. 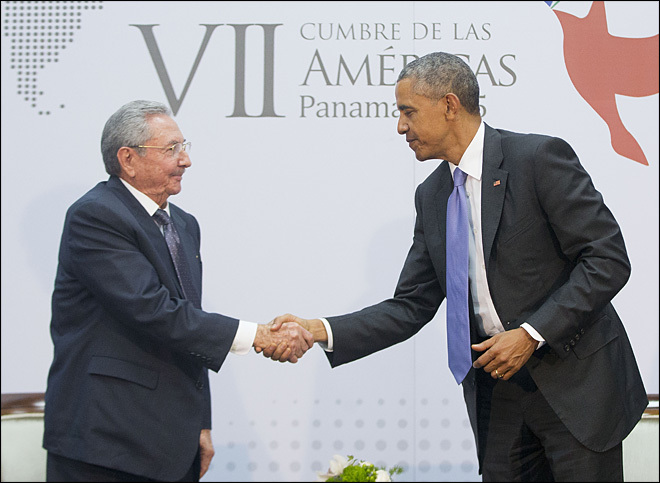 Obama said that the meeting was obviously historic between him and Castro. He called it complicated since there has been a great deal of mistrust developed by both countries. However, Obama said the time was right to turn that page and Castro said he agreed and that what the U.S. president had said reflected their same thoughts. Yet both acknowledged differences that exist between each of the two governments. Obama announced that the U.S. would be a voice for democracy as well as human rights, and Cuba would be raising concerns about policies in the U.S.
Castro said all talks, even human rights could be held, but only if they were respectful. He said we might not agree on some things today but maybe tomorrow we could. Obama said the Panama City trip reflected a new era for engagement by the U.S. in the region. Obama said the outreach his administration has made to Cuba had a majority support in the U.S. and overwhelming support in the Caribbean Island nation. When asked if his outreach to Cuba ended the policy of Cuba’s regime, Obama responded by saying the U.S. was not looking for regime change, but making sure the people of Cuba have freedoms and the ability to shape their lives.